Poster presentations are an important and effective means of displaying scientific results. Therefore, posters will be exhibited during the entire congress (from Monday to Thursday) in the Poster Exhibition (Foyer 14.2). They will be grouped according to topics and presented in two parts. Selected posters will be displayed in digital form during the afternoon poster session following the poster award ceremony. In order to maintain the international character of the congress and to enable all delegates to present their work in an optimal manner, all posters must be prepared in English. Standard poster walls will be available in the Poster Exhibition (Foyer 14.2). The maximum size of a Poster should be DIN A0 (84.10 cm wide x 118.90 cm high). Adhesive material and help will be available to poster authors from the Poster Help Desk in the Poster Exhibition. Posters numbered from P001 to P279 should be mounted on Monday, 26 September 2005, by 09:00 hrs at the latest and should not be removed until 16:00 hrs on Tuesday, 27 September 2005. Removal should take place between 16:00 and 18:00 hrs in order to enable the next group of authors to mount their posters to schedule. Posters numbered from P280 to P555 should be mounted on Wednesday, 28 September 2005, between 08:00 and 09:00 hrs and will remain on display until 14:00 hrs on Thursday, 29 September 2005. The organisers will remove posters that have not being removed by the times indicated above and will deposit them at the Registration Counter, where they will remain until 16:00 hrs on Thursday, 29 September 2005 and if unclaimed will then be destroyed. Selected posters will be displayed in digital form during the afternoon poster session. To optimise the preparation of this presentation, all authors are asked to observe the following requirements: Maximum five pages (without animation) in Microsoft PowerPoint or PDF format. All images and graphics should be integrated and PDF documents should automatically start in full picture mode. Posters will be displayed in landscape format with a screen resolution of 1024 x 768 dpi. Comprehensive administrative and technical provision for digital poster presentation will be supplied by M Events Cross Media GmbH. 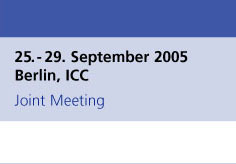 Electronically prepared posters should be submitted to http://soe2005.m-congress.com between 10.08.2005 and 09.09.2005. Therefore authors will receive a separate e-mail from M Events Cross Media GmbH with access information and instruction regarding formats and codecs. PowerPoint or PDF presentations and all integrated graphic, audio and video data will be uploaded directly onto the congress server. Technical questions may be e-mailed to soe2005@m-congress.com.